Watching the horror that unfolded in moments over an Oklahoma City suburb made me wonder if storms today are more treacherous than they used to be. Twice in my life, I’ve been spared the wrath of Mother Nature during a tornado outbreak. I was seven. We saw Mary Poppins at Fort Wayne’s Jefferson Theatre that April Sunday afternoon. I remember — in great detail — Mary Poppins’ arrival and departure from the gracious English home of Mr. and Mrs. Banks. The wind always shifted when Poppins (as her chimney sweep friend called her) was about to arrive or depart. The movie made a big impression on me, but not as big or memorable as the color of the sky driving home on that late Indiana spring afternoon. Indeed, the winds shifted for hours on that day and Indiana was never the same. My husband woke up and heard the warning sirens. We swiftly descended the stairs to our finished basement. Eight hundred homes in our community were damaged—many beyond repair. Just around the corner on Lincoln Avenue, an elderly husband and wife were blown into the middle of the street. Our 15-year-old son camped that weekend at Scales Lake with his Boy Scout troop. The Scout master shook our son and his tent-mate awake and shoved them to the concrete bathroom nearby. 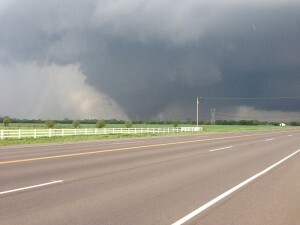 After destroying our town, the tornado passed directly over the lake area, killing five more people a few miles east. The three Scout troops huddled among the various concrete buildings at the park escaped harm. My husband and I decided to wait until daylight before driving the ten miles up to the lake to retrieve our son. Cell phones were working, and we knew one of the Scout leaders (who was also our neighbor) always had her phone with her. As dawn broke, I walked over to the neighbors and see if the Scout leader’s husband had heard anything from his wife. As I crossed the street between our houses, I saw her truck come over the hill, with my son and her 14-year-old. I was very happy to see the three of them. In both of these tornado outbreaks I knew someone who lost his life, several who lost everything, and many who had damage to home and property. The amazing thing about a tornado, if you’ve never seen one, is that one minute the sky can be clear – albeit the color of mustard – and the next it looks like the scene from The Wizard of Oz. The reporting on the Moore, Oklahoma storm, figured against my experiences, raises so many questions. Has the absolute science defending climate change proved that storms will get worse, unless we reverse greenhouse gases? Is that even possible? Do we need to live differently? Can we afford to lose our collective shirts in more storms like the Oklahoma City tornado? Should we reconsider shelters, expensive toys, cramped communities? Storm Shelters: Since the Oklahoma tragedy, the 24/7 media coverage has talked endlessly about storm shelters. In my parents’ era, most people had underground root cellars which also found double-duty as storm cellars. When my parents’ built a classic middle-class ranch home in the 1960s, digging a basement was just too expensive. During a storm, we huddled in the center hallway and lucked out that the frequent Indiana spring tornadoes missed our house. Digging into the bedrock of Tornado Alley is expensive, so many Oklahomans don’t have storm shelters. Reports I’ve heard said building a “safe room” — a relatively new concept of constructing a steel-and-concrete structure within or below the home — costs eight to ten thousand dollars per new house. After the Oklahoma City tornado in nearly the same area at the end of the 1990s, many homes and new buildings were built to include shelters. While I suspect replacements in the Moore, Oklahoma area will be built to higher standards, how can you build a storm shelter to withstand an F5’s winds? I’m no architect, but I think keeping any building safe with winds more than 200 miles per hour roaring about, is a huge challenge. As the old margarine commercial suggests, sometimes you just can’t fool Mother Nature, even with steel-reinforced walls. I think in horror of the small children huddled in the hallways of those elementary schools, huddled as schoolchildren have for generations, hands behind head next to a concrete wall expected to handle the velocity of the storm. We Have More Stuff Now, More Expensive to Replace: When the Palm Sunday tornado ripped through the Midwest in 1965, residents may not have had homeowner’s insurance. In the mid-1960s, the average home didn’t have a dishwasher or air conditioner. In April 1965, the average price of a home was $19,900, less than the cost of a new Toyota Camry today. Was there a color television in every room, a Bose sound system, cell phones, computers and tablets all adding thousands of dollars to what was insured in a home? No. Many homes in 1965 did not have more than one television, and chances are it was not color; networks had just started putting prime time shows in color. This is the expensive reality of a technologically focused society; we have more valuable toys to lose, adding peril to an already overly bloated insurance system. All Crammed Together: Another factor is population. I heard a police officer interviewed on NPR who talked about the growth of suburbs outside of Oklahoma City. He said that had this tornado happened 25 years ago, there would have been nothing but farmland there. This is, of course, not the case today, nor is it the case in most cities. People move to the suburbs. It’s what we do. But look at HuffPost’s before and after pictures. HuffPost’s before and after satellite photos showed the suburban sprawl, typical to many large cities. I’m not suggesting this is wrong, but storms can clearly do more damage with a denser concentration of people and their “stuff.” Are we willing to experience the consequences of sprawl? The storms are not getting less intense. Today everyone is hepped up on helping the people of Oklahoma. Multiple social media posts offer ways to help those who suffered, and the media offers a non-stop litany about “how we’ll all get through this.” Hope is important but I can’t help but think of the people of New Orleans, the Ninth Ward, still mostly mired in red tape, or Sandy Hook Elementary School, where recovery still seems far away. Are these questions merely rhetorical, or is there a way we can answer them and address some of these issues? In light of a planet gone berserk, is there anyway to change weather patterns or even respond to them? News reports highlight the disparity between our preferred free markets and legislation that requires all new homes be built with safe rooms. Ask yourself: how does Congress respond to any requests for federal support of local disasters? For me, I know my family has been very lucky twice. You can’t really regulate luck nor can you regulate Mother Nature. Published May 23, 2013 on The Broad Side.